I've been working on preparing some lectures for my upcoming semester of Business Intelligence Systems at University of Canberra, and I wanted to add in some teaching on Social Network Analysis (SNA). This is the social influence mathematical models, not looking for keywords on Facebook posts (Social Media Analysis). 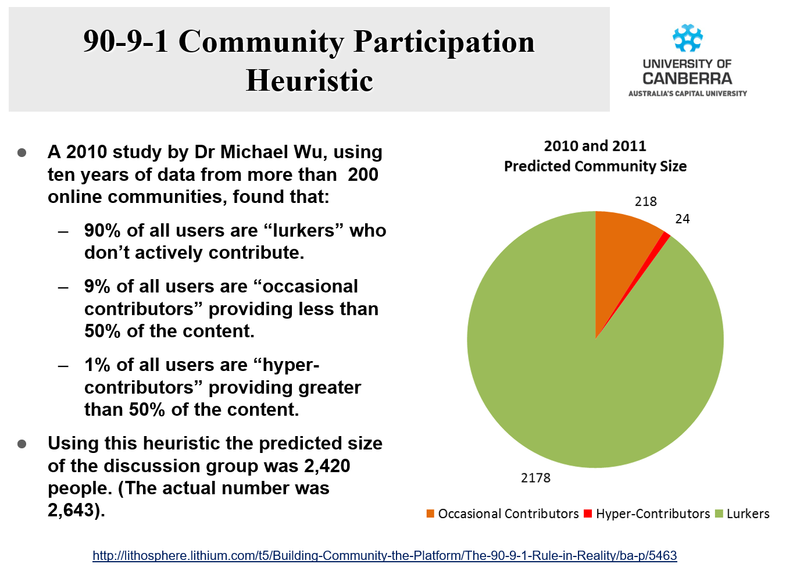 I was looking through some old lecture slides from previous professors who've taught this class, and I came across an interesting statistic that kind of 'feels' right, but I was curious as to whether or not it holds true and then I realised; we have a 'social network' of sorts right here. and I was wondering; do we have any figures that show what Worldbuilding's participation model looks like? What about other stack exchange sites? It would be interesting to see if these 'real world' networks of people, all tasked with common goals, conform to this statistical assessment. From a scientific perspective, I'd even be willing to put the figures into the lecture as an objective assessment of the rule, either for or against. I believe we have a stats and query engine of some kind, and I have to admit I've never taken the time to learn how it works or what the query language even looks like, but I just thought that from a group perspective this was an interesting idea to share in any event. So to the question: Does Worldbuilding conform to a 90/9/1 contribution model? Browse other questions tagged support users statistics . Does someone have the source image of this site?